How has the importance of Black Friday and Cyber Monday evolved over the years in your market? What do you think these events will look like in the future? Has this impacted your companies planning for these events? Black Friday/Cyber Monday started out as just two of the biggest sales days for retailers and now has evolved into almost a full week. Retailers are typically starting their BF/CM promotions the day before Thanksgiving and running through Cyber Monday. We’ve also seen the addition of new sales days that include Green Monday (or Cyber Monday II) and Free Shipping Day. Looking towards the future, I foresee companies expanding their promotional dates throughout the holiday season, maybe as early as October. For example, Target this year introduced Free 2nd Day Shipping starting November 1st. Also, free shipping is no longer the exception, its the standard (see Amazon in 2018 waiving minimum orders for the holidays to receive the free shipping benefit.) Other retailers will soon have to follow suit. Tell us about how your company is preparing for Black Friday and Cyber Monday 2018. 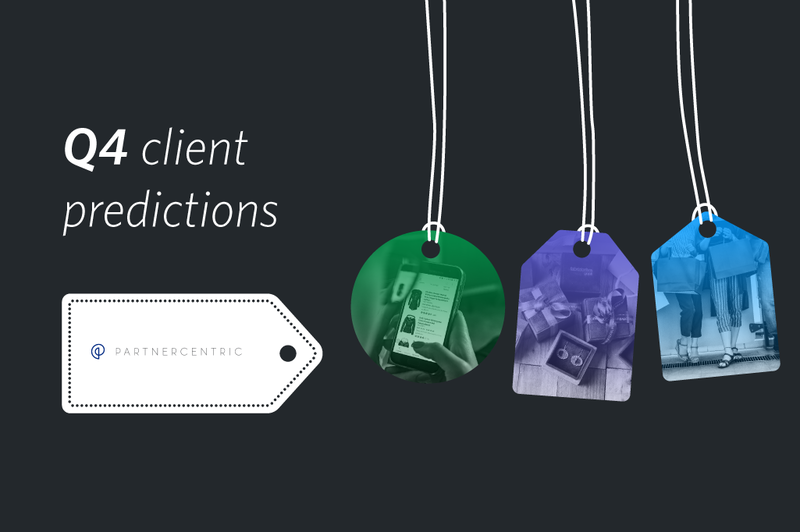 Going through 12+ years of Black Friday and Cyber Monday planning, PartnerCentric makes sure to have a tailored and organized approach for each client. Preparation starts early in Q3 by first gathering the client’s goals/plans for the upcoming quarter, reviewing last year’s insights, and securing opportunities based on insights, budget, goals and promotional calendar. What do you think of global retail events like Black Friday and Cyber Monday? Are they a positive thing for your business? What challenges do they present? Black Friday and Cyber Monday have created a chance for retailers to provide their best offerings and tap into a new customer base. If your offer is strong enough, you’ll have the ability to get in front of new eyeballs, specifically online. Each year, we’re seeing a significant increase in e-commerce sales thanks to all of the sale events during the holidays. I find the challenge is how do you top it? How deep of a discount can you offer without losing your bottom line? Also, how can you stand out among all of the offers? What value can affiliates contribute to your clients' objectives during Black Friday and Cyber Monday? New customers! This is where an unknown brand, or a really special promotion can stand out. With retailers paying to play during the holidays, the volume and exposure can help get your brand in front of new customers. PartnerCentric clients secure paid placement budgets coupled with higher rev share to help lessen the expense of additional exposure. This is where affiliates actively contribute to a higher ROI. Further, the rise of micro-influencers, historically the tail of a publisher base, are coming into focus as an often less-expensive and higher converting alternative to the traditional leading influencers. What is one tip would you give to fellow companies participating in Black Friday and Cyber Monday activity this year? Take successes from the previous year and try to duplicate them. If a placement performed well with a certain publisher, try to book it again and provide a similar (if not better) offer. To learn more about Black Friday 2018 opportunities on our network, contact your account manager or our publisher management team.